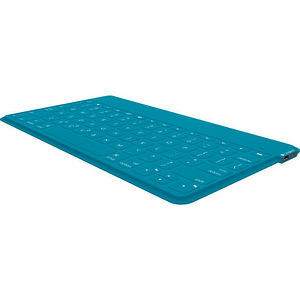 Keys-To-Go, the super slender, uber handy, ultra portable, fit anywhere, go everywhere keyboard. You're going places. Take a keyboard. Keys-To-Go packs light, types comfortably and never leaves you at a loss for words. Exactly what you expect from a Logitech keyboard. Well-spaced keys with feedback for comfort. iOS® keyboard shortcuts for productivity. Bluetooth® wireless pairing. Rechargeable 3-month battery. Life gets messy. Wipe it clean. The durable FabricSkin wards off dirt, crumbs and spills no matter where you are or what you do.